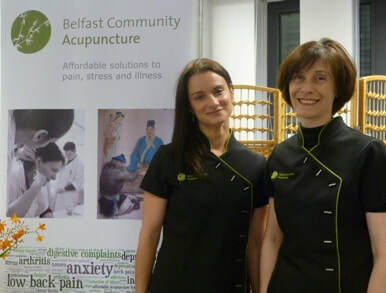 Treatments We Offer - Belfast Community Acupuncture "Acupuncture Belfast" "Belfast Acupuncture" "Belfast Community Acupuncture" "community acupuncture" "chinese medicine"
Acupuncture is an ancient technique that originated in China and involves the insertion of acupuncture needles for the alleviation of pain and suffering due to poor health. The evidence base for acupuncture is a long term project with some rigorous science now published to support it in several areas. Traditional Chinese Medicine (TCM) is the standard curriculum for traditional acupuncture globally, although many styles, approaches and theoretical frameworks are taught and practiced and today acupuncture is a diverse discipline. Between us we practice several styles, from TCM to anatomical/western. Mary and Emma are both trained to treat a range of conditions. Read lots more about what to expect from an appointment with us and about some of our adjunct therapies below. Emma is an ITEC level 3 diploma Sports Massage Therapist with a Gateway Workshops diploma in Deep Tissue Massage. Currently Emma can offer massage integrated into a complete session that may include any of the therapies on offer at the clinic, thus ensuring that the right balance of the most appropriate available therapy is offered. Glass or bamboo cups are placed on the skin having created a vacuum with a lit taper. The sensation is a pleasant warming and pulling sensation as the muscles are gently lengthened and local circulation is stimulated. Oil can be applied to the skin for sliding cupping which stimulates a wider area. It's generally used for chronic tension but we have also seen it used in China for respiratory disorders too, and as an alternative to electroacupuncture. See FAQs for more info. We love this treatment! Auricular (ear) therapy may be offered on its own or more frequently integrated into a complete treatment. It involves the insertion of tiny needles into the ear. A prickly and warm sensation may follow. It is used for a wide range of conditions and we also frequently use it for psychoemotional issues such as anxiety and insomnia.